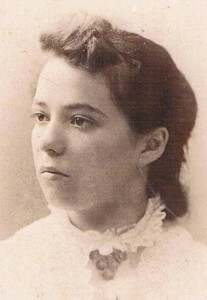 Pins pictured on this page are hinged pins. STICKPINS have been assigned their own page. 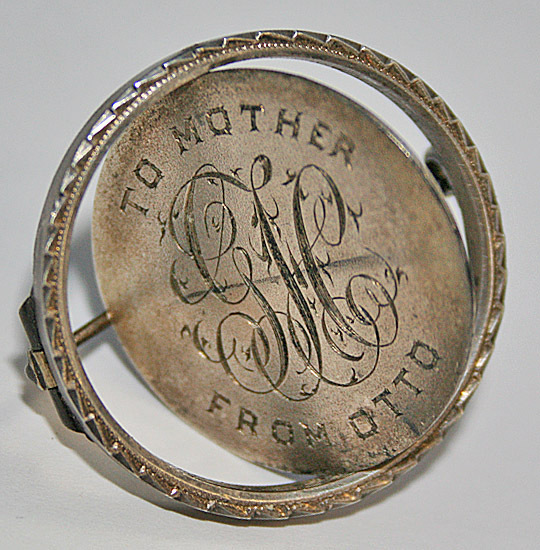 Most Victorian hinged pins have what is called a “C” closure. The pin simply slides into a”C” shaped hook. 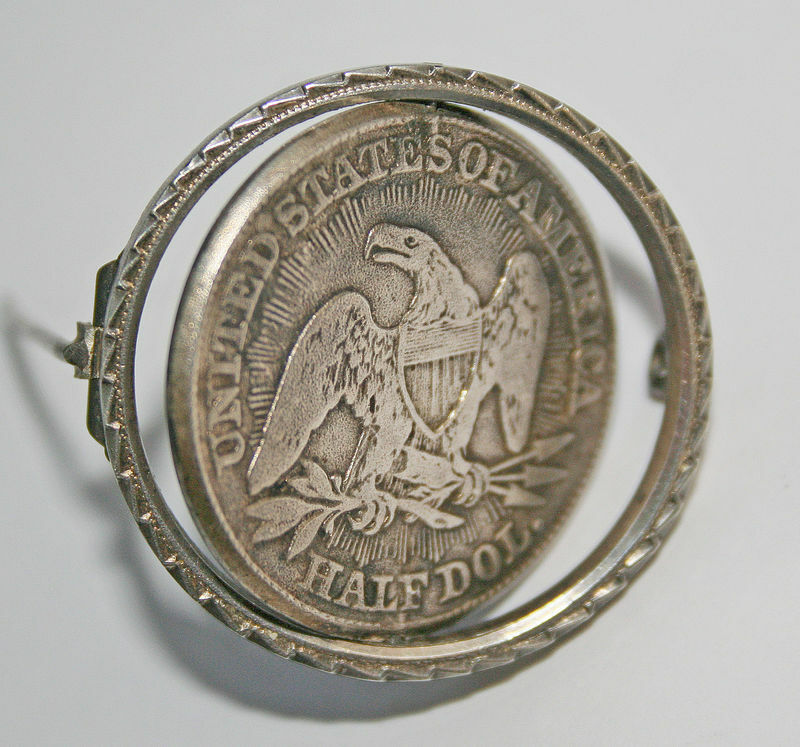 Circa 1890, two safety closures were developed with locking devices. 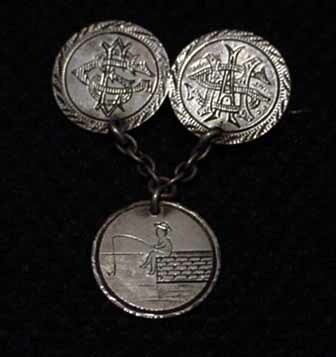 One had a swinging lever and the other was called a “tube” or “trombone.” Note, some love token jewelry may have had catches redone at a later date. 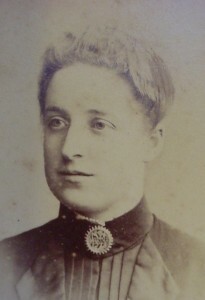 The style of a catch is in itself is not a conclusive way to date love tokens. Safety catches help guard a pin from slipping off a garment, so some pins may have been retrofitted later. 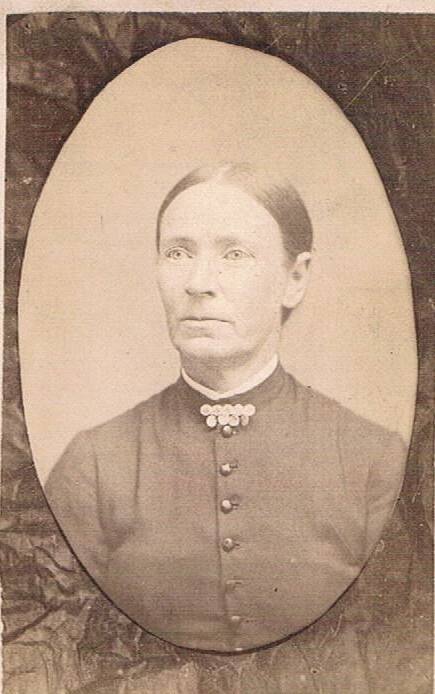 Jewelry may also require repairs done over time. 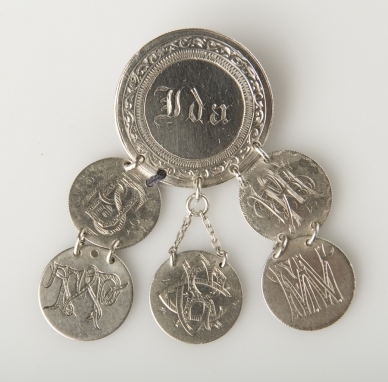 Thirdly, a love token may be gifted as a single coin and the recipient may have it made into jewelry at a much later date. The most common pin type was the single coin pin. 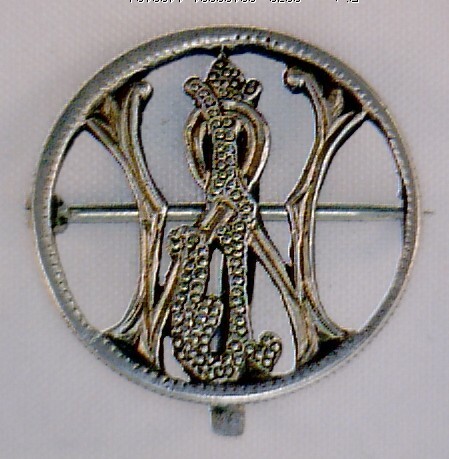 The bar pin was also a popular design for the period and was worn at the neck. Bar pins have long skinny dimensions. 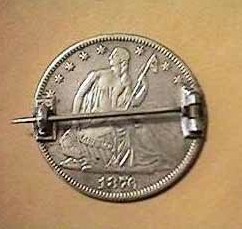 Some bar pins were made by soldering a string of coins together, while others had dangling coins from a standard bar. 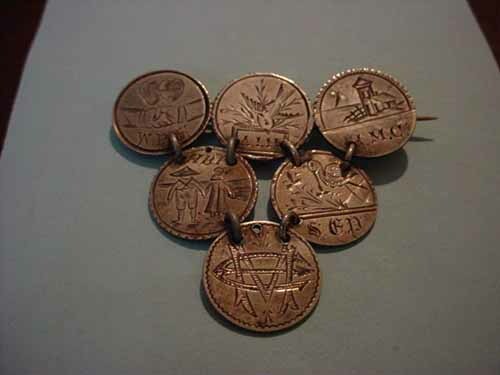 Occasionally the two methods were combined with a rigid row of love tokens having free moving dangling coins suspended from it. Scarcer are the cluster pins made from multiple coins and the “triangle” love token pin. It begins with a row of coins and then each row after diminishes in size until the bottom row has just one coin in it. The photo at the right is either a love token of a cut out silver dollar with the name “Martha” or it is just a sheet of silver cut to resemble a love token. * The “trombone” catch had a long tube with a nob at the end to grasp. The catch was designed to slide and encase the the pin bar. It is unlikely to find these catches on love tokens. 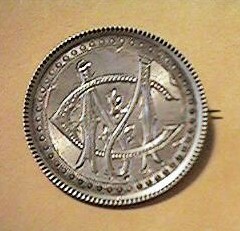 “MC” engraved on a 1876 half dollar pin. Note the fancy raised border. 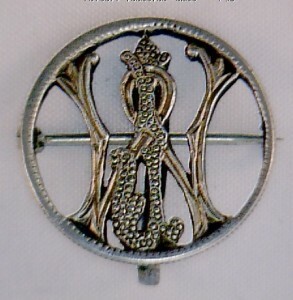 Reverse of “MC” pin at left. 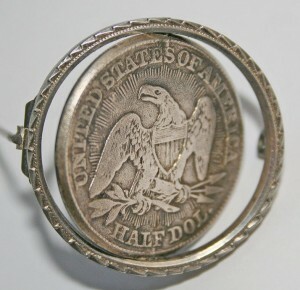 Notice the pin bar extends past the edge of the coin, a typical trait of earlier Victorian pins. 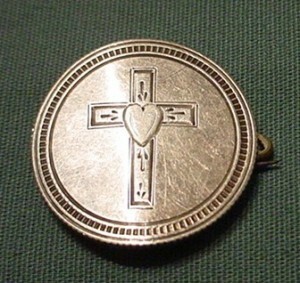 Cross with heart on a <1853> quarter. Pin is slightly arced. 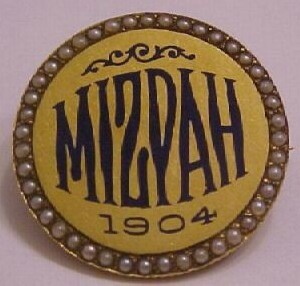 Exceptional bar pin made from enameled one dollar gold coins. This pin straddles the line between a bar pin and a cluster pin. It is really not wide enough to be grouped in the bar pin category. 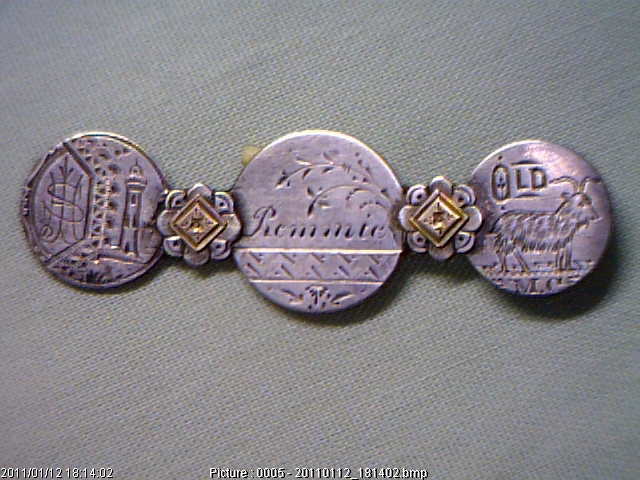 “Gussie” engraved on a silver bar with love tokens suspended. The bar itself is not always made from coins. 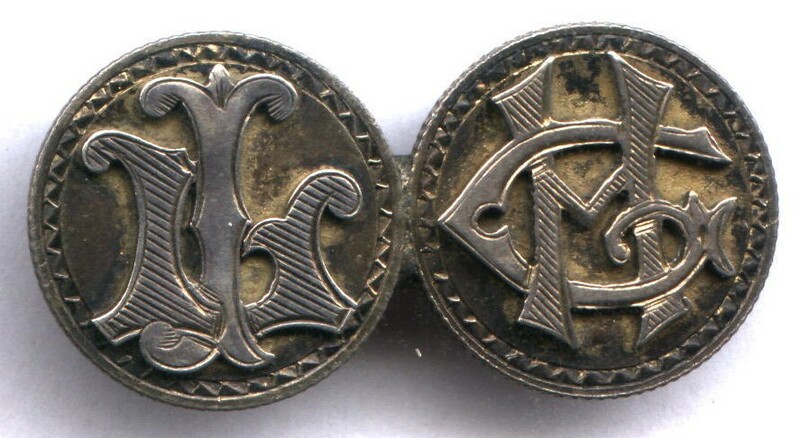 Love token bar pin. 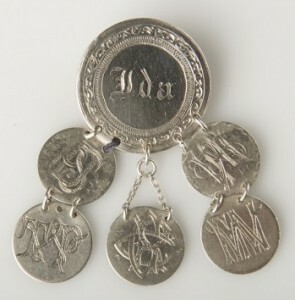 Love tokens used for the bar and the dangling charms. “Triangle” pin with multiple pictorials engraved. Antique “Triangle” pin photo. can be worn either side up. Note the silver overlay on this Canadian dime “short” bar pin. 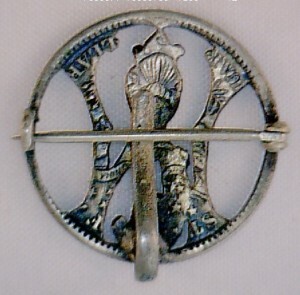 Bar pin with matching necklace on the necklace webpage. Note the “old” goat engraving on the coin at right. “JW” cut out and engraved. Hook on back to hang watch from.